Edith Hall, a professor of classics at King’s College London, tried astrology, Buddhism, transcendental meditation, psychotropic drugs and spiritualism before discovering Aristotelianism as an undergraduate. Aristotle appealed to her because he rejected the idea of divine intervention in human affairs in favour of scientific explanations for life and its phenomena. He was also considerably less miserable than the average philosopher. For Aristotle, Hall explains, ‘the ultimate goal of human life is, simply, happiness’. And who doesn’t desire happiness? In the tradition of Alain de Botton, she has written a practical and enjoyable guide to Aristotle’s philosophy as a recipe for contentment in the modern world. 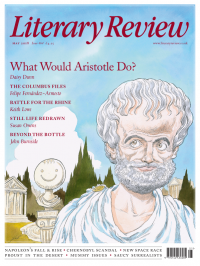 ‘Wherever you are in life,’ she writes, ‘Aristotle’s ideas can make you happier.’ Much of the time you need only to stop and ask yourself: what would Aristotle do? If Aristotle were applying for a job, how long would he make the covering letter? If he were planning a wedding, how would he ensure that it proceeded without hiccup? To find answers, Hall channels the philosopher himself. Aristotle advocated brevity in his rhetoric so Hall recommends limiting a covering letter to one or two pages of A4 in twelve-point type. Aristotle knew not to worry about what was beyond his control and endeavoured to prepare himself for all eventualities. Should it rain on a wedding day, Hall suggests, ‘Aristotle would simply supply an alternative indoor venue for photographs, a stand full of wedding-themed umbrellas, and extra hairspray for the bride’. It can be quite a leap between old and new. Aristotle was born in Stageira, a city-state in the northern Aegean, in 384 BC. He lost his mother and father, a doctor to the king of Macedon, when he was a teenager, and was raised by his brother-in-law. As a youth he moved to Athens, where he was taught by Plato. He later founded the Lyceum, ‘the first research and teaching university in the world’, but is perhaps most famous today as tutor to Alexander the Great. It’s surprising how comfortably Aristotle’s philosophy fits with voguish concepts such as mindfulness and self-love. Aristotle was not one for sitting back and seeing where life took him. He taught his pupils to think deeply about what they wanted and shape their lives accordingly. In Nicomachean Ethics Aristotle described the benefits of sketching an outline that could be filled in later on. Hall applies this idea to life-planning and summarises what Aristotle meant when he described happiness as ‘finding a purpose in order to realise your potential and working on your behaviour to become the best version of yourself’. Nurture what you are good at and you shall succeed. There is no room for self-loathing in the process. Happy people love themselves. Aristotle could even be seen as an early proponent of art as therapy. He wrote engagingly on ‘catharsis’, a process the German philologist Jacob Bernays explained as an excitation of the emotions followed by physical release, of the kind the audience of a Greek tragedy might experience. Hall likens the feeling to that shared by people who gather to watch tear-jerking films and weep together, an exercise she heartily recommends. ‘I can personally attest that the experience can bring about a sense of cleansing and alleviation of psychic pain, accompanied by pleasure,’ she writes. Aristotle viewed the ability to draw original parallels as an innate gift that could not be learned. I imagine he would have enjoyed this parallel. Hall develops some particularly interesting comparisons between Aristotle and Tolstoy. She even detects something of the philosopher’s influence in the opening lines of Anna Karenina: ‘All happy families are alike; every unhappy family is unhappy in its own way.’ Aristotle believed that good men are constant and that bad men are changeable. Follow Aristotle’s advice, she suggests, and you can avoid the predicament Ivan Ilyich finds himself in on his deathbed in Tolstoy’s novella The Death of Ivan Ilyich, wallowing in regret over his misspent life. Such adman-worthy lines are rare in Hall’s otherwise elegantly written book. She moves seamlessly from issuing practical advice drawn from Aristotle’s writings to analysing his principal ideas, weaving in some surprising material along the way. In the first thirty pages alone we find references to the films It’s a Wonderful Life, Sleeper, La Promesse, The Seventh Seal, Alexander the Great (the Richard Burton version) and the adaptation of Umberto Eco’s The Name of the Rose. We are also introduced to some colourful characters as Hall illustrates Aristotle’s philosophy in practice. There is the friend whose husband hired a private detective to spy on her because he suspected she was having an affair (it transpired she was spending all her time word-processing lecture hand-outs). A neighbour who refused to speak to his wife for two weeks because she locked the car keys in the car exhibits the un-Aristotelian quality of protracted and misplaced anger. Then there’s her former housemate who failed to heed Aristotle’s advice against adultery and seduced other women’s partners ‘because she had a bad relationship with her mother and spitefully enjoyed stopping any married woman from being happy’. But it’s Aristotle’s flexibility that proves perhaps the most appealing aspect of his philosophy today: ‘Aristotle insists that creating happiness is not a matter of fanatically applying big rules and principles, but of engaging with the texture of life, in every situation, with every galloping horse, as we meet its particularity.’ Aristotle may not solve all your problems, but he is more likely than Plato to put a spring in your step.